Sometimes you meet people in your life who effortlessly and wholeheartedly inspire you on a deeper level. Sometimes it’s a teacher or someone whose faith is similar to yours that you respect. For me and so many others like me (makeup artist by birth and trade), it was Michael DeVellis and the community he created that supported us. Michael has written a very short, but quintessential book called Ten Words : Words for a Stronger Career, More Meaningful Relationships, and a Remarkably Focused Life. The words he focuses on are: relationships, respect, experience, integrity, consistency, repetition, long-shot, generosity, development, community. The words and message fit anyone in any walk of life. The words are important to life itself. Here is what Michael had to say about the book and the movement. Karim Orange: How did Ten Words go from a moment to a movement? Michael DeVellis: It was an artist who had taken my Ten Words program many years ago and had run into another artist. They started talking about relationships (which is one of the ten words) in our industry. One of them mentioned me and the Ten Words workshop and then they had an OMG moment realizing they both had taken the program. The artist emailed me that night to let me know that there was a movement happening in our industry thanks to Ten Words. K.O: How has that evolved into the impact Ten Words has had on artists today? M.D: I think that the way that the program, and now the book, affects people makes them realize that they are not alone in their struggle and gives them the strength to keep moving forward even when it gets tough. Ten Words helps them rethink and prioritize. K.O: How receptive have artists been during your Ten Words Workshops? M.D: It’s a pretty eye-opening program. I am not reinventing the wheel here. It’s honestly all pretty logical stuff. I think we are so busy these days though – overwhelmed even – that it takes a program, or a book, to bring us to a place of looking at things and looking at the logic in how we move forward. K.O: You created a very ‘safe space’ for makeup artists in the wilderness with so many of your endeavors. Did the ten words you speak of in your book help you to build this community? M.D: Thank you for the huge compliment regarding the safe space we have created at The Powder Group – it’s truly a huge part of who we are as a company and community. K.O: If you could give Ten Words to Ten people in the world right now, who would they be? M.D: First and most importantly, I would give it to any person – artist, entrepreneur, writer, actor, human – who was going through a period of personal doubt and who is not ready to give up on their dreams or passions. Both of my Grandmothers – they never got to see any of what I created before they left us. I would love for them to know the influence they had on me in what I do and who I am as a person today. Oprah Winfrey- Just because she’s Oprah. And you know, the Book Club thing. Donald Trump- I think he has some serious issues with a lot of the words I focus on and I think he needs some serious help with his humanity. Jean-Michel Basquiat- he was the most talented and stunning creative artist in history. I would love for him to draw on each page for me (and then I’d want it back of course). Pope Francis- I think he’d get me. James Patterson- It’s only fair given how many of his books I’ve read. I think he owes me one. K.O: In What Ten Cities (or countries) would you like to sit down and read Ten Words? Paris– My final edit of the book was done sitting in the sun at the burial site of Oscar Wilde at Pere Lachaise cemetery. India– I would love to read it at an Ashram, to give me a new perspective. New York City– I would read it on a Broadway stage to an audience of my pro beauty industry colleagues. Washington, DC – The White House – see the Trump answer above. K.O: If you could have one dance with anyone (dead or alive) who would it be? K.O: What song would you dance to? 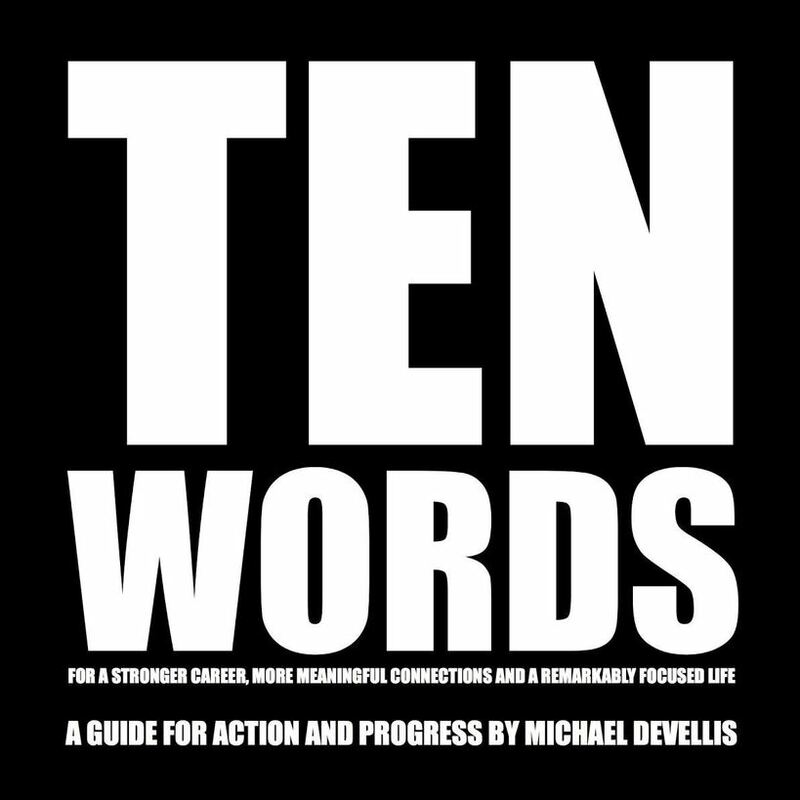 It’s a new season, and I would suggest picking up a copy of Ten Words and sharing it with ten friends.